Lotteries are one of the oldest forms of gambling; however, thanks to the advent of online gaming, this world of numbered balls and bumper jackpots is now much more accessible. Of course, before you can start speculating, you need to have an overview of the lottery landscape – here's a guide to lottery jackpots around the globe. Operating on the well-known principle that the whole is greater than the sum of its parts, a lottery jackpot is the result of thousands or millions of people putting a small amount of money into a communal pot. For example, the UK Lotto, which was known as the National Lottery when it first launched in 1994, originally had a ticket price of £1. For that amount, a player could purchase a single line of six numbers ranging from 1 to 49 (now 59 numbers). Under the game's rules, 47.5% of each £1 buy-in is put into the prizepool. Thanks to this structure, National Lottery jackpots (66.4% of the prizepool) always top the seven-figure mark. Naturally, any time more than one player matches six numbers (the top prize), the money is split evenly between the winners. Conversely, if nobody wins the jackpot in a given week, then the jackpot is "rolled over" to the next. These incremental wins make the lottery a much more fruitful endeavour, as even though the jackpot is clearly the ultimate goal, scooping a smaller prize along the way certainly helps. However, as attractive as incremental wins are, the most appealing aspect of any lottery is its ROI (Return On Investment). As explained, a lottery's prizepool is made up of small contributions from millions of players. This dynamic means that, for a small investment, you could (if very lucky) win a huge prize. Indeed, take a standard casino game such as blackjack. This game allows you to earn a return of even money on your bet when you take on the dealer and win. Although the chances of winning a single hand of Blackjack are much greater than winning a lottery jackpot, the multiplier on your stake is significantly greater when you play lotteries. Although the actual return will differ from game-to-game, the wins will generally be millions-to-one. Available in 46 US localities, the Mega Millions (formerly The Big Game) was formed in 1996 and, today, a single ticket costs $1 and the minimum advertised jackpot is $15 million. Jackpots are paid out in annual instalments or a single lump sum (a smaller amount than the advertised jackpot). Mega Millions draws take place at 11:00pm Eastern Time on Tuesday and Friday evenings. The UK Lotto is state-run and first came into being as the National Lottery in 1994. Since then, the format has changed to include 10 extra numbers and an increased ticket price of £2 (up from £1). Now called Lotto, draws take place every Wednesday and Saturday. 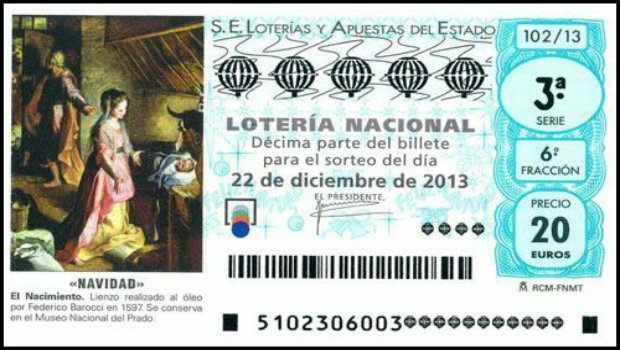 A one-off lottery held at Christmas, this game is often hailed as the largest lottery in the world, with the 2012 top tier ("El Gordo") prizepool topping €720 million. Active since 1812, the draws take place just before Christmas day and the structure of the game makes it possible for hundreds of players to win top tier prizes. Merle and Patricia Butler (Illinois) as well as an anonymous winner (Kansas) shared a record $656 million Mega Millions jackpot on March 30, 2012. Eddie Nabors (Georgia) and Elaine and Harold Messner (New Jersey) shared a $390 million Mega Millions jackpot on March 6, 2007. Jim and Carolyn McCullar (Washington) won the $380 million Mega Millions top prize on January 4, 2011.